1. 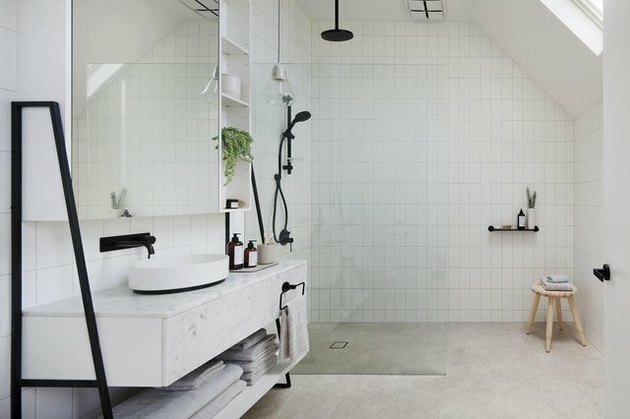 Here's a good, basic place to start: a white, tiled shower with industrial fixtures. 2. Deck out a floor in a geometric tile pattern, and continue it halfway up the wall for a striking backsplash. 3. 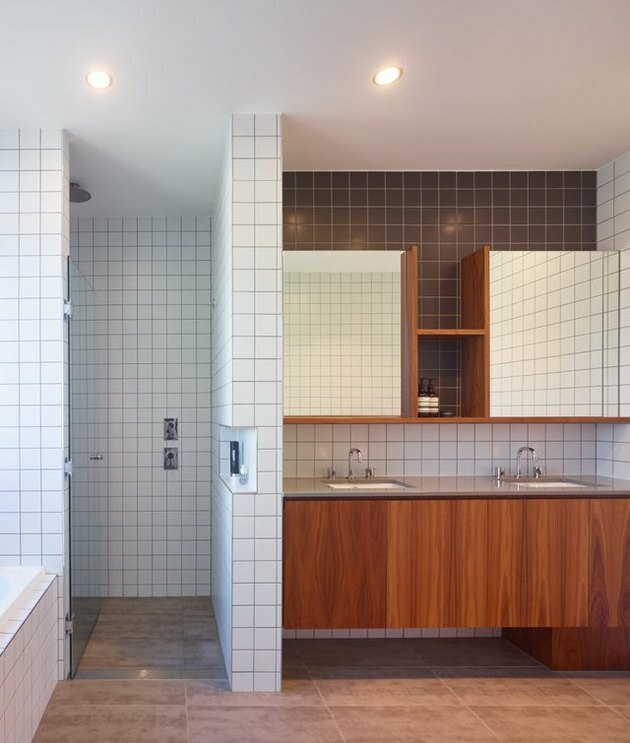 Turn subway tile around and place it vertical instead of horizontal. 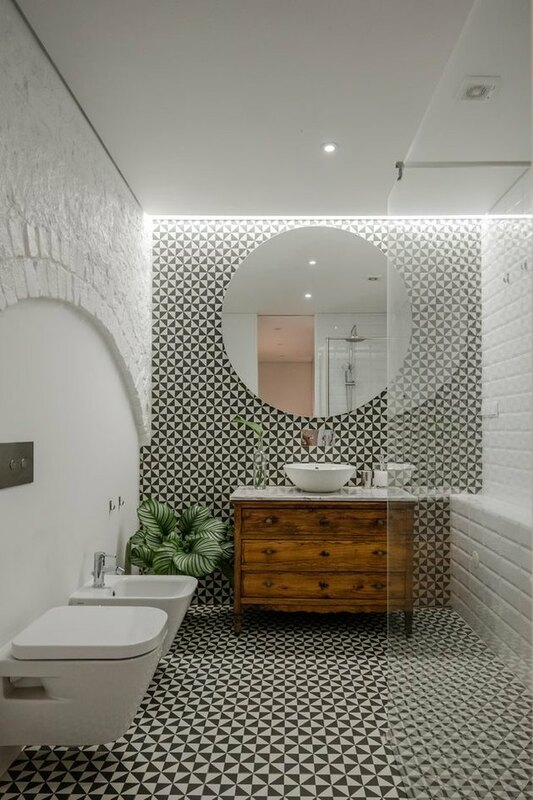 In this bathroom, it quite literally mirrors the shape and direction of the mirrored cabinets. 4. Busy prints in bright colors can be a bit overbearing in a small space. The solution? Go black and white with your wallpaper. This particular print is by Christian LaCroix (read: $$). 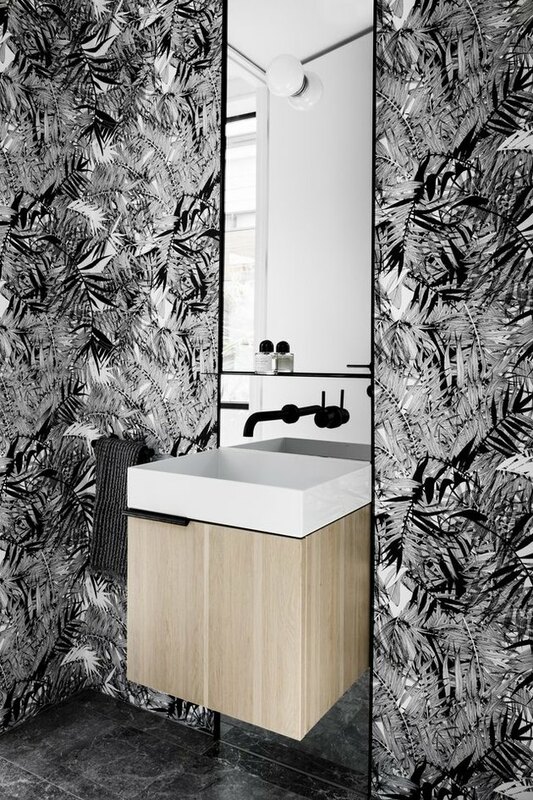 Walls Need Love's removable retro palm wallpaper is a way more affordable option. 5. While black and white themes tend to appear in more modern or minimalist environments, don't be afraid to mix in unexpected antiques, like an old dresser up-cycled into a sink station. Check out Domestic Imperfection's awesome tutorial. 6. 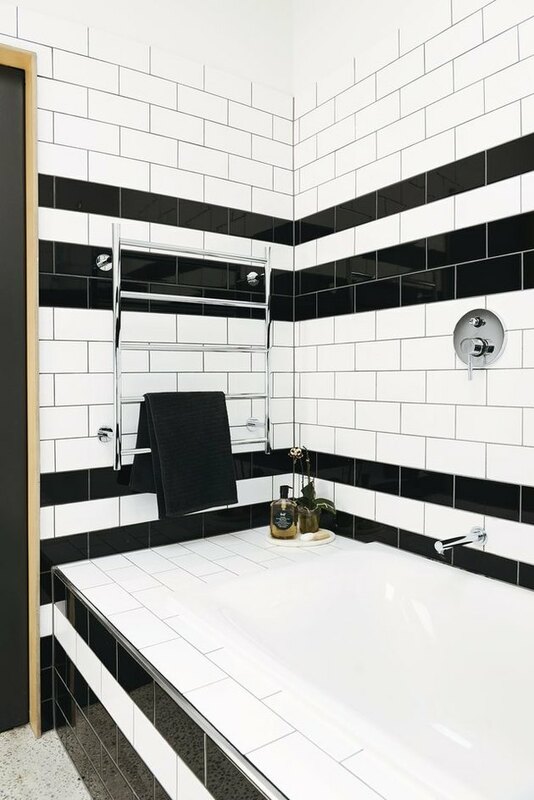 Create stripes with subway tile for a look that feels hotel-worthy. 7. Welcome to penny tile heaven! The work on this bathroom is exquisite. 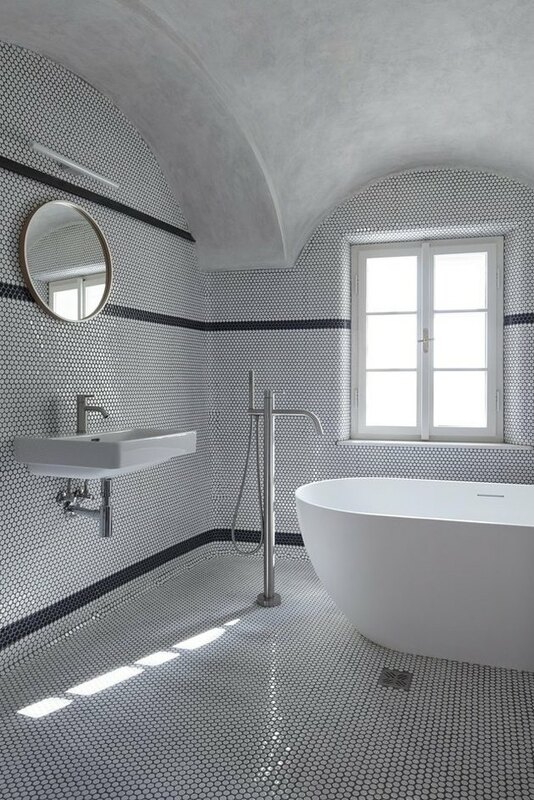 By tiling nearly all of the surfaces, you get a Turkish bath-like vibe. 8. 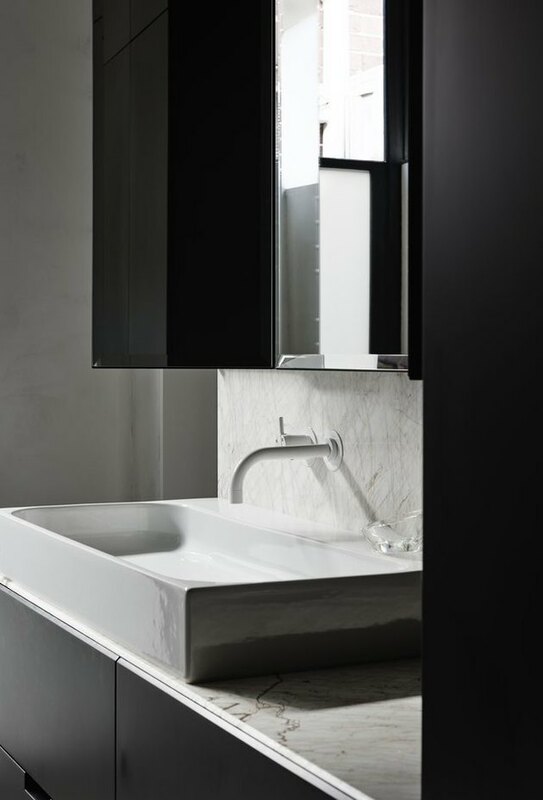 Black and white marble goes great with other black and white details. Just sayin'. 9. Working a natural element — like teak — can soften the space. 10. 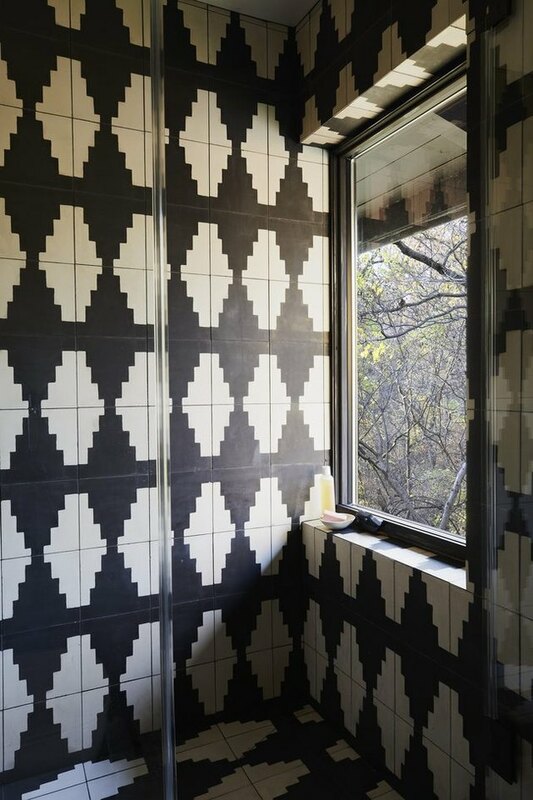 These Zuni Zebra tiles from Exquisite Surfaces are inspired by Native American step patterns. 11. 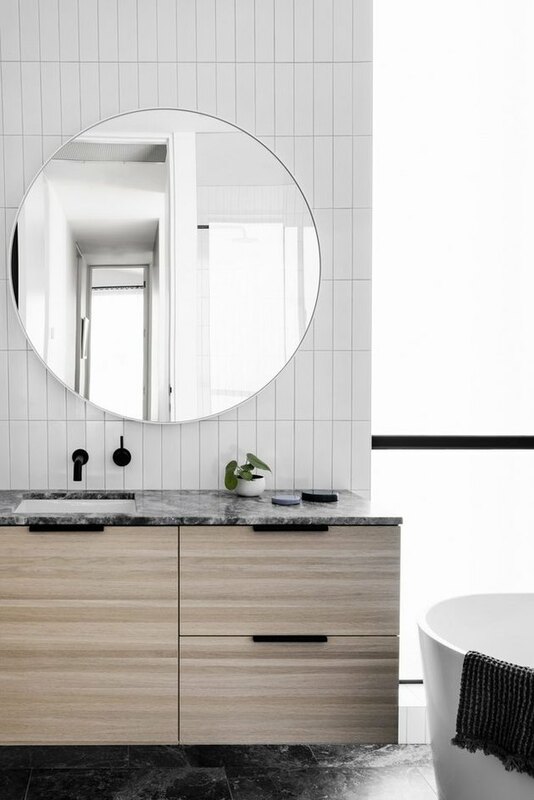 Not to play favorites ... but this black and white bathroom might top our list. 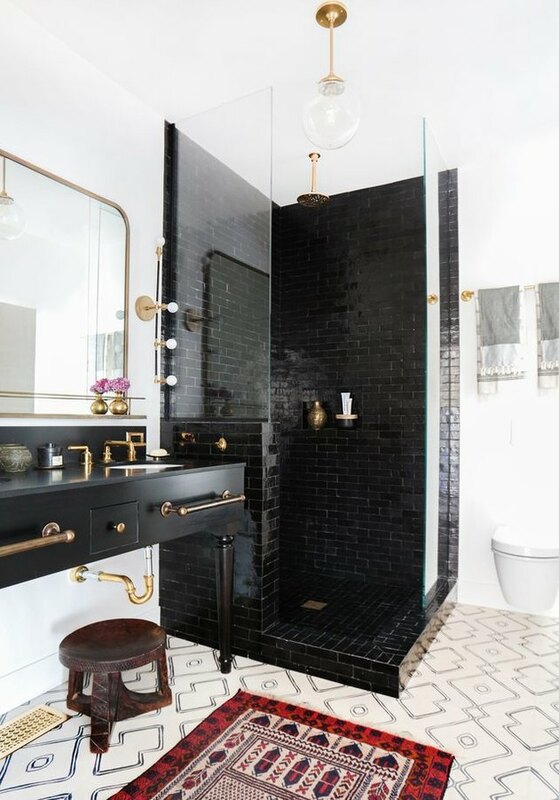 Everything from the shiny, black subway-tiled shower to the brass fixtures to the vintage sinks makes this the type of room you wouldn't stop Instagramming. 12. 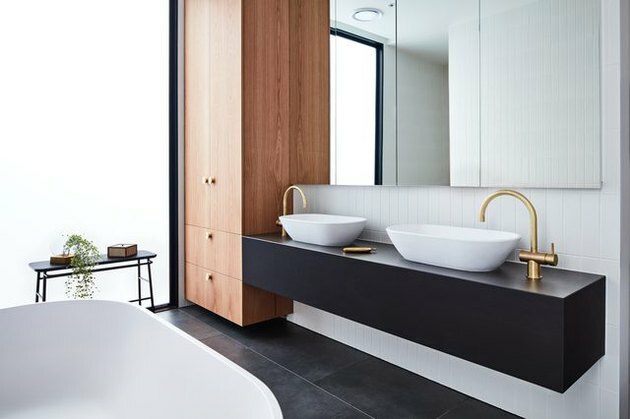 It doesn't take much to make a bathroom look impressive. 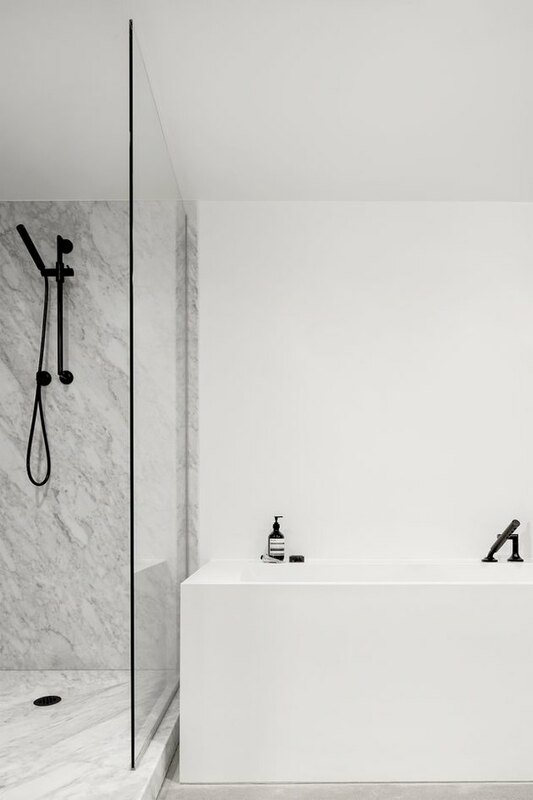 There are really only a few elements at play here: black fixtures, a marble shower, a glass divider, and everything else stark white. 13. 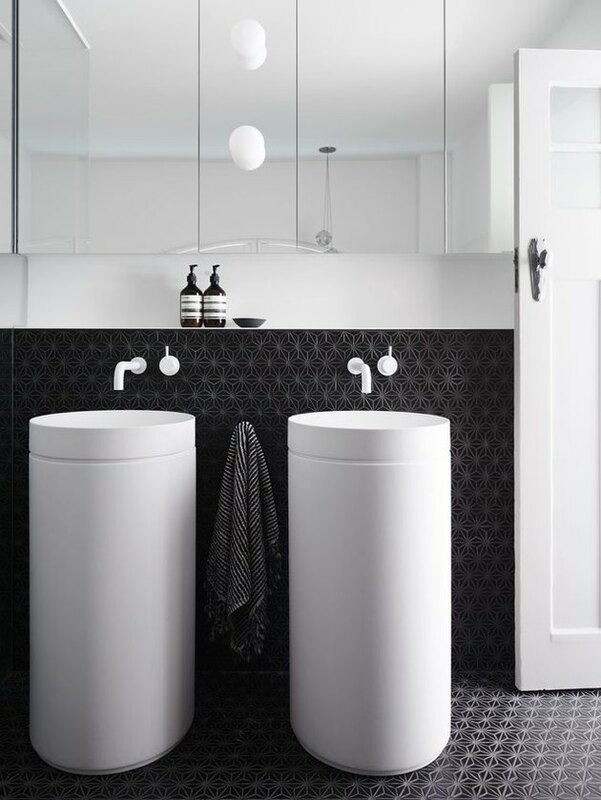 Black and white makes a great background to play with contrasts in shape — take these oval sinks and tub that stand out thanks to that bold, black rectangular base. 14. 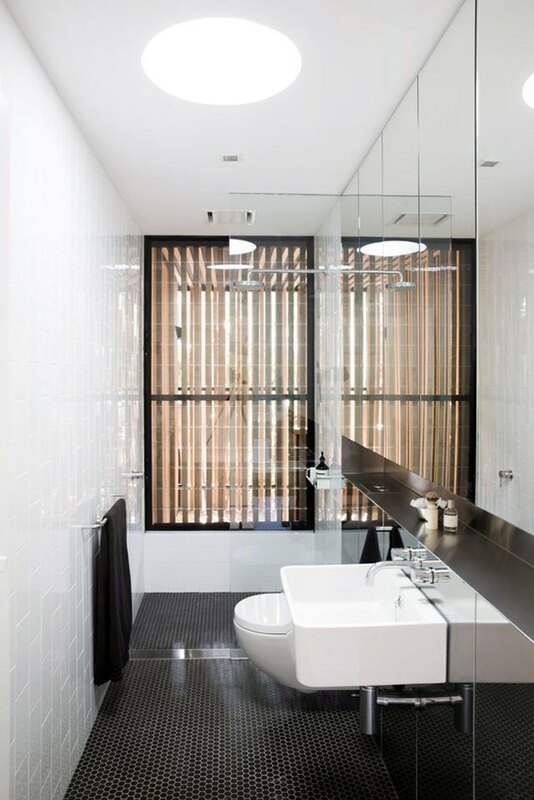 We're loving the white-on-white that's happening in this luxe bathroom.